William Helfand poses with items from his heralded collection of medical and pharmaceutical ephemera. The American Institute of the History of Pharmacy is saddened to learn about the recent death of longtime AIHP member and past President William H. Helfand. An avid collector of and an internationally recognized authority about the history of medical ephemera, Helfand first joined the Institute in 1953 and was a frequent attendee and contributor to AIHP events and activities. Helfand served as AIHP President in 1965-66 and again from 1989-1991. He was the AIHP Second Vice President in 1963-64 and the AIHP Secretary in 1967-68. He was a member of the AIHP Council for 23 years between 1966 and 1993, and the Institute recognized his many years of service by appointing him AIHP Honorary President in 1993-94. Over the years, Helfand authored or co-authored nearly 70 articles for Pharmacy in History, including 51 installments of his popular “Historical Images of the Drug Market,” which featured items from his unparalleled collection. He also wrote several books published by AIHP, including Medicine & Pharmacy in American Political Prints and Potions Pills and Purges: The Art of Pharmacy. AIHP fondly remembers William Helfand and his dedication to preserving and researching the history of pharmacy. Read more in his New York Times Obituary. 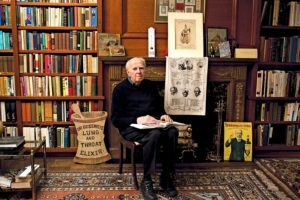 William H. Helfand, noted collector and authority on the history of medical ephemera, died on October 2 at Connecticut Hospice in Branford, Connecticut. He was 92. Helfand—who published widely on the social history of prints, caricatures, posters, and pharmaceutical ephemera—was the author of five books, including Pharmacy: An Illustrated History (co-authored with David Cowen, 1990), The Picture of Health (1991), and Quack, Quack, Quack: The Sellers of Nostrums in Prints, Posters, Ephemera, & Books (2002). A longtime trustee to The Philadelphia Museum of Art and The Library Company of Philadelphia, he received numerous honors for his contributions to the history of medicine and pharmacy, including the 1972 Kremers Award and the 1989 Urdang Medal, both from the American Institute of the History of Pharmacy. In 1986, Helfand was awarded the Pepys Medal from the Ephemera Society in London for his outstanding contributions to the field of ephemera studies. In 1997, with his wife Audrey, William Helfand endowed the Senior Curatorship of Prints and Drawings at Philadelphia Museum of Art. In subsequent years, he endowed research fellowships at the New York Academy of Medicine, the Library Company of Philadelphia, and the Grolier Club in New York, where he served as President from 2006 to 2010. A generous benefactor to a wide range of research institutions including The John Hay Whitney Medical Library at Yale, The David M. Rubenstein Rare Book and Manuscripts Library at Duke, The Huntington Library in Pasadena, and The New York Academy of Medicine, his voluminous collection included bookplates, caricatures, trade cards, valentines, sheet music, broadsides, prints, posters, and printed ephemera. William Hirsh Helfand was born on May 21, 1926 in Philadelphia, the eldest of three children. He received a degree in Chemical Engineering from the University of Pennsylvania in 1948, a degree in pharmacy from the Philadelphia College of Pharmacy and Science in 1952, and honorary doctorates from the Philadelphia College of Pharmacy and Science and the Albany College of Pharmacy. In 1987, he retired after more than 33 years as an executive with Merck, the multinational pharmaceutical company, where he served as President of the French division from 1970 to 1974. Helfand died of heart failure, having spent his last years as an active advisor and friend to academics, historians, and collectors in the fields of medical and pharmaceutical history. Predeceased in 2002 by his wife, Audrey (Real) Helfand whom he married in 1954, he is survived by his daughters, Rachel and Jessica, and four grandchildren.